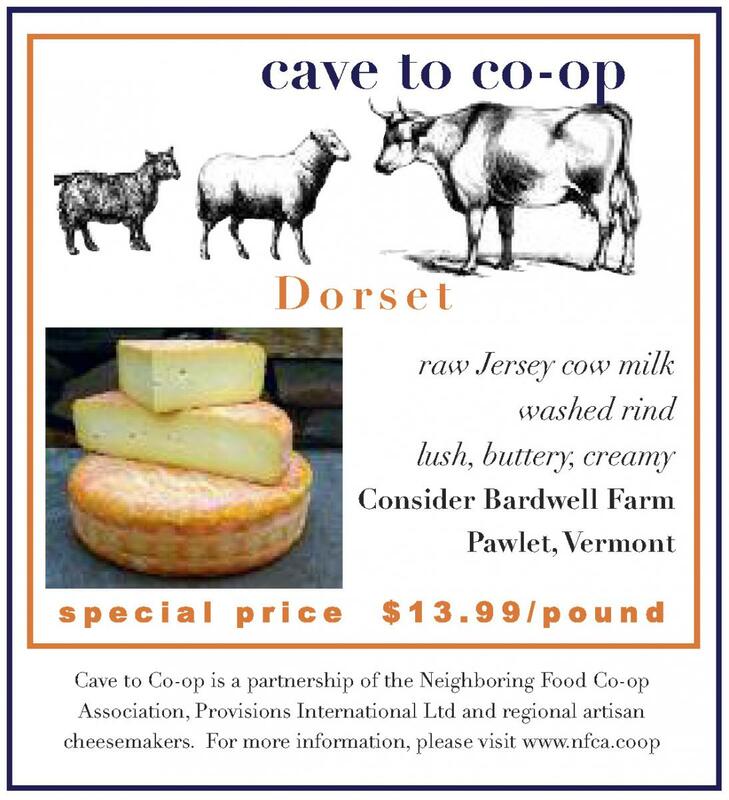 This month’s special cheese is DORSET from Consider Bardwell Farm, Pawlet VT.
Spanning the rolling hills of Vermont’s Champlain Valley and easternmost Washington County, New York, 300-acre Consider Bardwell Farm was the first cheese-making co-op in Vermont, founded in 1864 by Consider Stebbins Bardwell himself. A century later, Angela Miller and Russell Glover are revitalizing the tradition with goat milk from their herd of Oberhaslis and cow milk from their two neighbor farm partners—the Brooks and the Browes. Rotational grazing on pesticide-free and fertilizer-free pastures produces the sweetest milk and the tastiest cheese. All cheeses are made by hand in small batches from whole, fresh milk that is antibiotic and hormone free. Only microbial (non-animal) rennet is used in the cheese making. All of the cheeses are aged on the farm in an extensive system of caves. Dorset is a washed-rind, raw Jersey cow cheese with a rich, buttery texture and seasonally influenced pungency. Earthy and complex with a beautiful basket weave rind, Dorset is a savory, nutty and earthy delight that is perfect for November; great on a cheese plate and useful in the kitchen – here’s a few ways to use it! Cook the maple bread in two batches: Heat a large, heavy skillet over medium heat and, when hot, add ¼ cup of the maple syrup, 1 ½ tablespoons of the butter and a pinch of salt. Add 4 slices of the bread and immediately flip to coat in the buttery maple syrup. Cook, flipping often with a butter knife, until the bread is lacquered with the syrup and takes on a toasted look and the bottom of the pan is coated with just a dry film, about 4 minutes. Smear a slice or two of Dorset into the bread and serve immediately. Begin cooking onions in canola oil in a medium-sized sauté pan over high heat for 5 minutes, stirring frequently. Lower heat and cook for 20 minutes, or until onions are caramelized and sweet tasting, stirring occasionally. Add up to 2 tablespoons of water to onions when necessary to prevent burning and sticking. Let cool. Toss arugula with olive oil in a separate bowl. Spread ½ tablespoon of butter on one side of each bread slice, using 2 tablespoons total. Begin building one sandwich by spreading ½ tablespoon of butter on the unbuttered side of one of the bread slices. Layer half the arugula on top of the butter, followed by half of the Dorset and half of the caramelized onions. Top with another piece of bread, buttered side up. Repeat steps for the second sandwich. In a medium sauté pan over low-medium heat, melt the remaining tablespoon of butter and add the sandwiches, arugula side down. Resist the urge to flip until the first side is golden brown, 4 to 5 minutes. Flip, turn heat to low, salt the top slice of bread, and wait until the second side is golden brown, about 5 minutes. Serve immediately. A rib sticker if there ever was one! Place the potatoes in the pot, cover with water, and bring to a boil. Cook for about 20 minutes, or until the potatoes are easily pierced with the knife. Remove from the heat, drain, and let sit until they are cool enough to handle. Cut the potatoes into small chunks and set aside. In the sauté pan, cook the bacon over high heat until browned. Drain, leaving 1 tablespoon of fat in the skillet and add the onion. Cook over moderately high heat for about 5 minutes until golden brown then add the bacon and wine and cook for another 5 minutes, stirring occasionally. Add the potatoes and season with salt and pepper. Remove the potato mixture from the heat and place half of it in the ovenproof dish. Spread half the cheese slices atop the potato mixture. Cover this with the other half of the potato mixture. Top with the remainder of the cheese. Bake in the hot oven for 20 minutes, or until golden brown and bubbling. Serve hot. For the crust: Add the flour, salt, and sugar to a food processor and pulse to combine. Add the butter and pulse until the butter is finely chopped and the mixture resembles coarse meal. Add the mascarpone cheese and lemon juice and pulse a few times. Add the ice water and run the machine just until the mixture is moist and crumbly, but does not form a ball. Do not overmix. Turn the dough out onto a sheet of plastic wrap. Press into a disk, cover, and refrigerate for 30 minutes. For the filling: Put an oven rack in the lower third of the oven. Preheat the oven to 375 degrees F. In a medium bowl, combine the apricots, walnuts, lemon zest, cinnamon, and sea salt. Add the honey and stir until all the ingredients are coated. Stir in 2/3 of the cheese. Cut a piece of parchment paper to fit inside a 12 by 17-inch baking sheet and put it on a work surface. Put the chilled dough on the parchment paper. Roll the dough into an 11-inch circle, about 1/4-inch thick. Lift the parchment paper and transfer it to a baking sheet. Put the apricot filling in the center of the dough, spreading evenly, leaving a 2-inch border. Fold the dough border over the filling to form an 8-inch round. Pleat the edge of the pastry and pinch to seal any cracks in the dough. Arrange the remaining cheese on top of the filling. Using a pastry brush, brush the crust with the beaten egg. Bake until the crust starts to turn golden, about 15 to 18 minutes. Cover the crostata loosely with a piece of foil and cook until the crust is golden and the cheese has melted, another 12 to 15 minutes. Remove the crostata from the oven to a cutting board and uncover. Cool for 10 minutes, then cut into slices and arrange on a serving platter. Serve while still warm.